We have finally made it to Penang! We had hoped to make it here for Thaipusam in late January, then Chinese New Year in early February, but kidney stones and a slew of what-nots decided otherwise. 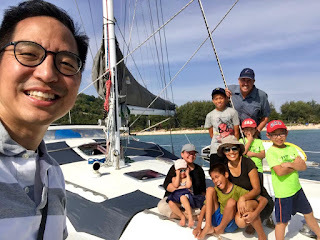 In the final installment of our whirlwind tour around Langkawi's Geoforest Parks (see part 1 and part 2), we visited Kilim Karst Geoforest Park. We visited caves and fed fish at fish farms, while admiring the dramatic karsts surrounding the river where we anchored. With this installment we are currently making everything BIGGER. This is not a result of our aging eyes. Or is it? Aptly named, Langkawi has lots of sea eagles. You mostly see them soaring overhead and sometimes swooping down to scoop up a fish from the water. Tourists can even go to an eagle-feeding. The name 'Langkawi' is derived from the Malay for 'eagle' and 'reddish brown'. Although we have been to Malaysia before, it was Borneo and not the area around mainland Malaysia. Kuah, on the island of Langkawi, is not a big city by Malaysian standards but it has a McDonald's and a movie theater (which had 2 movies in English and 3 in Mandarin or Cantonese), as well as a seemingly unlimited supply of duty-free shops. Anyone can do it, but would you want to? My brother Joe, his wife Joyce and their three kids made a side-trip to see us in Phuket while on a visit to Thailand. We haven't seen them in forever and this is the first time we got to meet all the kids (the last time I saw the oldest, he was a baby). The visit was short but sweet and we all had fun catching up.